I came across this website and was quite convicted. Reading statistics about how much money we Americans spend on unnecessary things makes me realize how selfish we truly are. No wonder we have this "I-am-so-good-in-and-of-myself-and-I-don't-need-God" mentality. God, please forgive us and help us to not be blinded by our unnecessary wealth. Near Death Experiences and New Realizations. It is scientifically impossible to laugh while you are not breathing. I should know...I tried it today. My roommate almost killed me with her humor. On top of that, I had a massive gulp of McDonald's Iced Coffee in my mouth. Laughter and iced coffee aren't meant to be enjoyed together, I learned. But I also came to the realization that the best way to die would be to die laughing. So here's to near death experiences and new realizations! Apparently, we are. 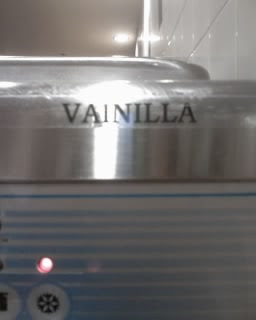 This is our vanilla ice cream sign at school. A couple weeks ago, one of my teachers sent me a thank you email for participating in class. Keep in mind, this was not a response to an email I sent him...he just sent it out of the blue. I thought it was the funniest thing EVER! (You might not understand why it is so funny, but know that it is. lol.) Today, I got another thank you from a teacher. This, on the contrary, was a response to an email I had sent, but it was funny nonetheless. "Thank you for being a conscientious student," it said. Hahaha! I just must be majorly amazing or something! Just kidding...I'm not really that amazing. We are just lumps of clay. Our lives aren't about doing favors for God. Let Him anoint you! Know that He loves you and wants to fill you with His Spirit! God doesn't want new commitments; He just wants YOU! "We live in a confused culture." That's what my mom said today as we were leaving the mall. We were rushing to get to my cousin's house but we were waiting in line foreeeeever for the guy to come back just so we could exchange a $10 lamp that we accidentally got in the wrong color. Anyways, he finally gets there, we exchange our lamp, and walk to the escalator. This woman gets to it right before us and stands right in the middle. We managed to squeeze to the right of her and walk up so we can pass her. As we are walking out of the mall, my mom and I are discussing the fact that everyone seems to be so slow paced but us. Then my mom points out that everyone in this culture is confused... "No one ever wants to walk anywhere. Even if people are going to the store right down the street, they hop in their cars. Then at the mall, they see an escalator. 'Oh good! Moving stairs! Now I don't have to walk anymore!' Then, they wake up at FOUR IN THE MORNING so they can go to the gym! It would save them a lot of gym membership money and give them more sleep if they just walked up the escalator!" Hahahaha! My mom is hilarious for thinking like this! Whole Wheat Noodles and Lameberry. I don't miss my shows for just about anything. Only the greatest people would cause me to miss them. Yvonne + Colleen = great people. So, tonight, we made dinner (amazing, btw...and whole wheat noodles are way better than people claim) and got so stuffed that our esophaguses have probably gained some weight. But that didn't stop us. We went to Coolberry too. We parked right in front of it and were pleased that the sign said "open." Colleen goes to reach for the door handle and pulls it. Nothing. The lady mopping inside didn't even flinch--didn't even lift her head and let us know that they were closed. Then I noticed the sign. They closed at 8:30. "Coolberry?! More like lameberry!!" Colleen so eloquently said. Lameberry indeed. So...we drove to Cherry On Top instead. And just so you know, it is amazing! 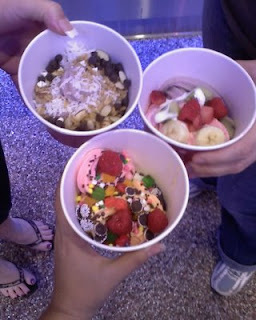 Here are our frozen yogurts! Pretty much, this way the best way to miss my shows. I'd do it every week! P.S. I still need to try Lameberry. It just deserved to be blogged. Yvonne and I walk into the caf at lunch and Wanda greets us by saying "Yo yo yo!" Now, if you know who Wanda is, you'd understand why that is so funny. If not, it might benefit you to know that she is a cute, little old woman. She then proceeds to ask us, "Did you girls stop by the seminary tables yet?" "Umm..no..." we both said in slight confusion. There is a grad school fair going on at school today and we were wondering if we had seminary written all over our faces or something. "Why?" we asked. "There are some pretty good looking men out there at a few of the tables...at Golden Gate and Southwestern." After lunch, we went to see if Wanda was right. Nah, she has different taste than we do. So there you go! If you are a young male from Golden Gate or Southwestern, you should be pleased to know that Wanda thinks you are attractive. Pretty much, everyone and their moms should read this blog! hahahahaha! Funny, I find myself getting a lot out of novels. Granted, they ARE christian novels so I guess that's the point. But anyways, in Where Yesterday Lives by Karen Kingsbury, there is a part that talks about how a rope of three cords isn't easily broken. 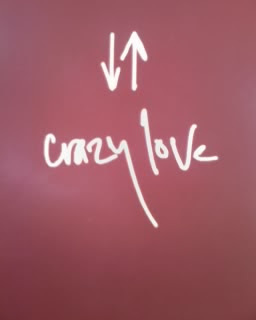 In the novel, it was talking more along the lines of guy/girl relationships, but I think it applies to any sort of relationship. And that really got me thinking. Any friendship where God is left out just seems to fall apart. And that makes sense. When there are only two cords, if one breaks, the rope is then broken. But when one out of three cord breaks, the rope is still there! I've seen that happen a few times in some of my friendships. Even in friendships where my friend and I are both Christians, there are situations where God is left out of our relationships. And that's when problems arise. I guess I am seeing more and more these days the importance of Christ being right in the center of everything. Not just his name being tagged along, but His very being right there with me in everything. Somewhat of a struggle at times, but after all, I am human. It's a learning process. So, jillian totally gets cool points. Because of her, i have made spontaneous history! 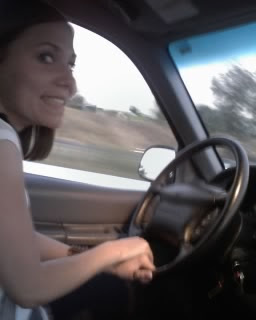 Jillian, ashley, and i are driving to san diego right now for the shane and shane concert! Yay! I have never done something like this so all of a sudden! Totally decided to go and left in like five minutes. Ha! All for the sake of green grass! Honestly, do they even have to ask?! The turf smells like every cow on the planet had a bad case of diarrhea! No one wants to be within even one mile of the turf! I wonder if this is detrimental to our health. 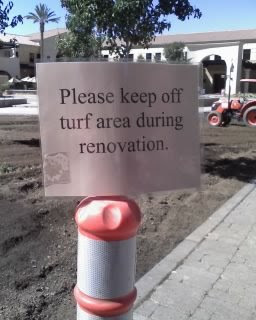 It probably is... All for the sake of green grass! Random Facts of the Day. There is no Acts 8:37. 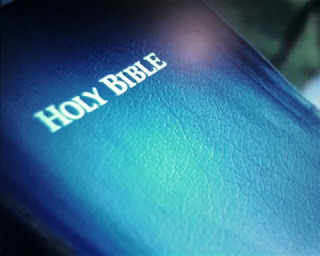 The only versions that have the missing verse 37 are the King James and the New King James. Funny how I never noticed that before! Apparently the words compassionate, merciful, and pitiful are synonymous cuz in the King James version, James 5:11 states, "The Lord is very pitiful." Pretty much, after today, my respect for the King James Version is diminished. Since when am I not the slow one?? Ever since I can remember, I have always been the slow one in school. I am always the last to finish assignments and I am always last to turn in tests. Well, apparently not this time. These graphic design classes are waaaaaayyyyyyyy too slooooooooooow. (Shout out to Rachel! I know you feel my pain!) In one of my graphic design classes, I finished my project earlier so my teacher gave me another one to keep me busy. I finished the second project before the rest of the class even finished the first! Then in this class (the one I'm sitting in and wasting time in right now) I finished my project early as well! Today was supposed to be "test print" day, but our teacher wanted to go around and look at people's work before having them test print. Problem: she already checked mine last week and I already test printed it! Our sketches for our next project were due today and I already did those too! Mannnnn, I cannot handle this slowness! I need some speed in my life! I apologize for that vent session. I just had to let it out. "Christians are like manure: spread them out and they help everything grow better, but keep them in one big pile and they stink horribly." Target was going through a lawsuit. Apparently, they didn't pay some of the people that should have been paid during their vacation times. Well, it just so happened that I worked at Target the summer of 2006. This was right smack dab in the middle of the time period that they were cheating people of their hard-earned money. Because of this, I was supposedly going to receive something in the settlement. That was already funny to me considering I didn't even work there long enough to receive paid vacations. Oh well, extra money never hurts. Yesterday, I got my settlement check in mail. It was a grand total of (get ready for this! )...FOUR DOLLARS!! hahahahahahahahaha! ($5 if you count what they took away from me in taxes.) Oh well, I'll get my $1 back at the end of the year. Oh the pros of being a dependent! Kristi sent me a message asking me if he had emailed me. It kind of made me a little sad that he didn't. When we gave him a copy of the Gospel of John, he promised us that he would read it and that he would email me when he did. Poor guy, said he was gonna be locked up in three days. Part of me did wonder, do they grant patients at a mental hospital internet access? I hoped they did. But nope, it's been close to two months and I never did get that email. I guess it's just one of those prayer reminders God gives us. I am thankful those seeds were planted in Ozzy's life and I hope and pray those seeds get watered someday.